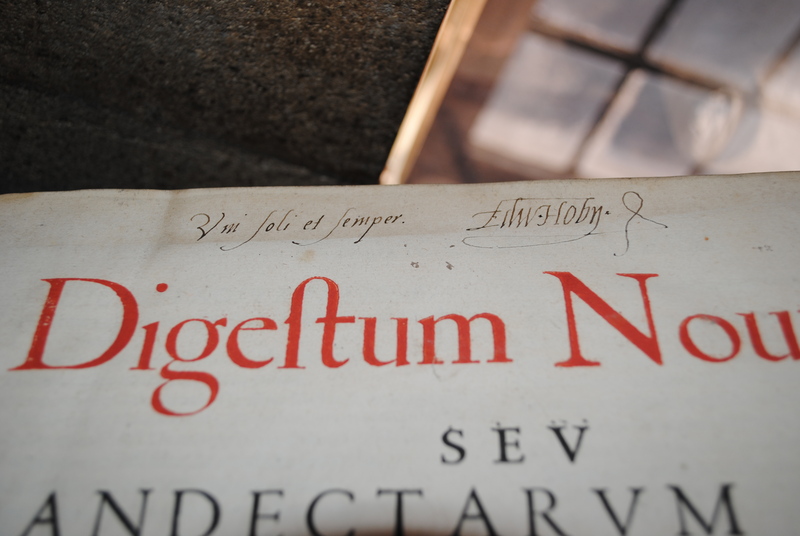 Catalogued recently in Brasenose College Library is a 5 volume set of part of the Corpus Juris Civilis, published in Paris in 1576 by Sebastien Nivelle. 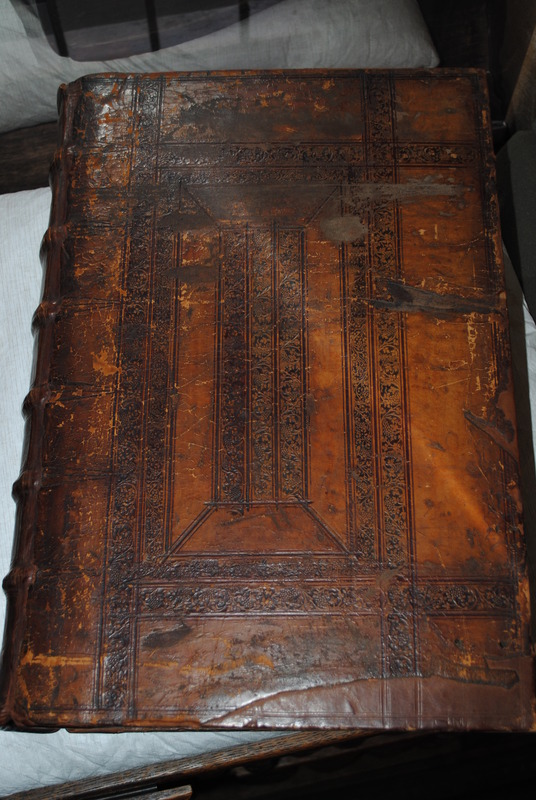 Not a particularly rare item in itself, but notable for it’s unusual binding and provenance. Sir Edward Hoby (1560–1617) was born in Bisham, Berkshire and matriculated from Trinity College, Oxford, in 1574. Through the influence of his uncle William Cecil, he was to become a favourite at the court of Elizabeth I. In 1584 he was returned to Parliament as MP for Queensborough and it was around this time that his path crossed with that of William Parry. Parry had been in the service of Cecil also, as a government spy, reporting on English Catholics abroad. By 1584 he was acting as Hoby’s ‘solicitor’ at court in addition to being returned to Parliament as the second MP for Queensborough. That Hoby and Parry had some dealings together cannot be in any doubt, so it is tempting to believe that the book had belonged to Parry (who had a legal training in Paris and London) and that he gave it to Hoby. 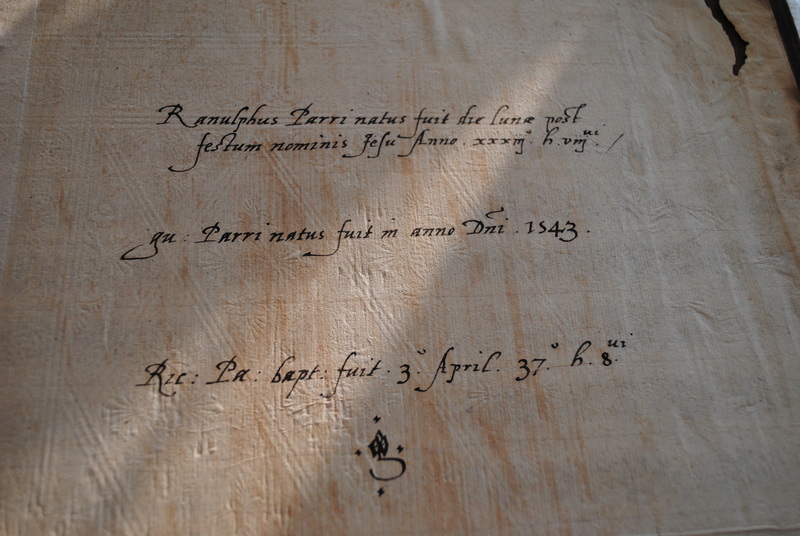 Whether or not it was given to Parry by Elizabeth is impossible to verify. It is also not clear how the book ended up at Brasenose, although coincidentally, Hoby does have a connection with the College, which took place ten years later in what became known as the ‘Sir Edward Hoby Controversy’. Elizabeth had given the manor of Upbury and rectory of Gillingham to the College ‘for the exhibition of her thirteen scholars, and to the further amendment of the stipend of the schoolmaster and usher …’. The manor went on to be leased to Sir Edward Hoby, at a rate of ‘5 marks and eight score and eight quarters of sweet straw-dried malt, to be [paid at] Christmas and Midsummer …’ For some reason, which is not clear, Hoby repeatedly refused to pay the rent, despite pressure from Cecil, and Lord Charles Howard, Lord High Admiral, and desired to have the matter tried by law. The Dean and College then made a complaint to the Queen who committed the hearing to John Whitgift the Archbishop of Canterbury, Robert Devereux, Earl of Essex and Lord Buckhurst, Chancellor of the University. The saga continued, with Hoby refusing to make an appearance at the Court of Common Pleas, and by this stage owing £800 in arrears. Finally, in June 1595, Hoby agreed to pay his arrears by November 1597. There the matter ended, apart from various further controversies over the method of payment! Unfortunately there are no extant library records from this period so it is not possible to tell when the volumes came into the possession of the College. William Parry was the son of a guard in the court of Henry VIII but his date of birth is unknown. He was apprenticed at a young age to a John Fisher, who had some legal training, whilst also attending grammar school. He found a place in the household of William Herbert, 1st Earl of Pembroke until 1570, when he entered the Queen’s service. In the early 1570s he went abroad and it is thought that this is when he began his career as a government spy. He spent the next few years going in and out of England, mainly in his work cultivating English Catholics abroad in order to report back to Lord Burghley, but also probably escaping his creditors who were pursing him for debts owed. He continued to spy for the government into the 1580s; although there were some doubts as to his trustworthiness, both the English government (including Walsingham) and the Catholics and papal legate in Rome had many dealings with him. In fact, by 1580, he was in such favour in the English court that Elizabeth gave him a generous pension and particular attention at court. He had seemingly abandoned his career as a spy and by 1584 was granted the position of MP for Queensborough, as well as acting as Edward Hoby’s solicitor at court; he presumably came to know Hoby through Lord Burghley. By the summer of that year he had probably started the communications with Edward Neville to assassinate the Queen which would eventually lead to his execution, early in 1585. There is some doubt as to whether Parry was simply continuing his ‘agent provocateur’ work for Walsingham or whether he genuinely intended to do harm to the Queen, but his apparent sympathy for Catholics over the years (as documented in his letters to Burghley and others) went against him. Whether this William Parry is the same one mentioned by Hoby in his inscription is impossible to verify but it is a tempting conclusion. The notes in volume 6 about other members of the Parry family may relate to William Parry but it is impossible to know for sure. 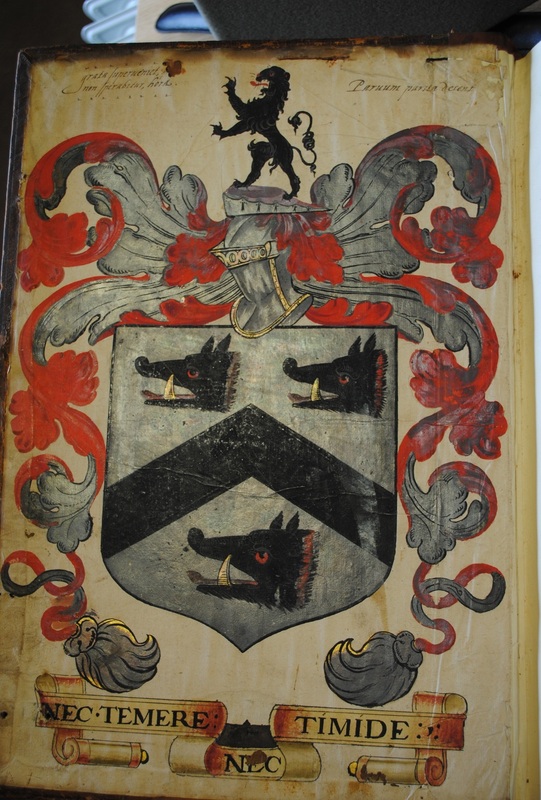 The large coat of arms painted on the inside of the upper board create another area of doubt as to provenance. A letter tipped into the flyleaf of the first volume dated 1948 from a Mr Cole of Berkshire discusses which family the coat of arms could refer to: the Ludlows of Heywood House, Wiltshire, or an unidentified Parry family. There also seems to be some confusion over whether the heads are boars or bears. Further work could perhaps be done on identifying the coat of arms which might then lead to a more definite provenance to this intriguing set of volumes. This entry was posted in Antiquarian, Books, Library and tagged Books, Brasenose College, cataloguing, College Library, Corpus Juris Civilis, Sir Edward Hoby. Bookmark the permalink.